Fischer Connectors and Draka have worked in close partnership to develop an integrated Triax HD system for cameras offering hugely improved transmission distance. The Draka Triax 11 HD pro cable has an OD of 11.9mm diameter and achieves the lowest loss of any triax of its size. It is perfectly matched to the Triax HD pro+ version of Fischer's 1051 series connectors. Both are optimised for 3G HD broadcast cameras. When combined the 1051 Triax HD pro+ system achieves more than 30% longer transmission distances than conventional 11.2mm triax, assemblies are 35% lighter, significantly more flexible and typically 30% cheaper than a 14mm triax equivalent. The TriaxHD pro+ system has been tested by most camera manufacturers who conclude that the absolute maximum length over which it can be used is dependent on the camera / CCU models; results up to 1700m have been recorded, with 1500m being typical. The Triax HD pro+ system is completely intermatable with all current and legacy Fisher 1051 series triax connectors thus cost effectively extending the performance of triax cameras, CCUs and infrastructure where the ultra-long distance performance of fibre is not required or is cost prohibitive. The HD pro+ cable mount plugs and sockets are based on the triax 1051 connectors which were completely re-engineered in 2007. A reduced number of internal parts and a more rugged exterior offers much quicker and simpler termination, improved RF / HD / 3G HD performance, greater strength and reliability. All 1051 series connectors offer IP68 protection when mated or fitted with latching dust caps. The internal cable clamp components are common to both SE and KE free cable-end connector styles. 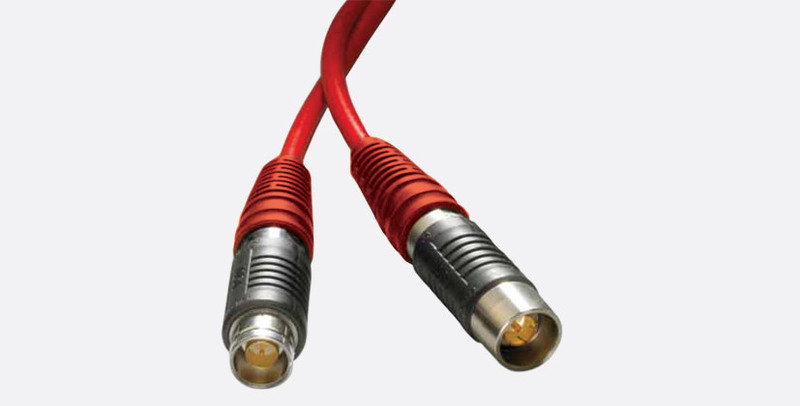 Once assembled the mating interfaces may be quickly and easily replaced if damaged, or swapped if cables are accidentally deployed the wrong way around, without disturbing the cable termination. (Note that the dust caps are attached to the strain relief on free cable types so will need to be removed and swapped or replaced if a connector gender change is permanent). Unlike SMPTE 304M/311M hybrid fibre, the Triax HD pro+ system is simple to maintain and can easily be repaired in the field or workshop. No special tooling is required to solder terminate the cable or fit the connector interfaces, however both inner conductor and braid may be crimped if preferred (crimp tools are available to special order). Both plug (SE) and socket (KE) come complete with a dust cap on a lanyard cord to protect against ingress of dust and dirt. 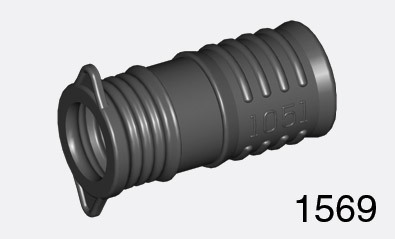 The rugged outer design of HD pro+ free cable-end types features an integrated protective ribbed TPE sleeve and distinctive red strain relief boot, an additional outer sleeve which covers all exposed metal parts is a recommended option. Panel mount plug (DSR) and sockets (DKE front mount, DKBE rear mount) have full cable clamping at the rear. They are recommended for all mobile applications, damp environments such as in external ducts and areas where cable retention and screening is needed such as the installation of pre-terminated assemblies. Rigid latching caps with a lanyard cord for attachment to termination panels are a recommended accessory to seal panel connectors when not in use. (Canford tailgate panels feature a threaded fixing hole adjacent to each connector position to secure the cap lanyard). A hook ('C') spanner (for DKE and DSR) and nut driver (for DKBE) are required to fit the custom panel mounting nuts. Open rear, solder-termination panel-mount styles (listed elsewhere) are not recommended for use with Triax HD pro+ cable since the outer screen and jacket are not clamped to the connector body and do not provide a secure or screened termination. They are suitable for use only in dry and clean environments such as closed cases or camera / CCU housings. 1051 series couplers and feedthroughs are completely compatible with Triax HD pro+ connectors. Couplers may be used to join cables or interface with panel connectors where plug-to-plug (SE-SE) or socket-to-socket (KE-KE) connections are required. Square flange mount couplers allow connection between cable plug-to-plug (SE-SE) or cable plug-to-socket (SE-to-KE) through a panel. Fischer specify connector mating interfaces and cable clamp kits (which includes strain relief and dust cap) separately however Canford have combined all required components for each connector under a single stock code to simplify ordering. Dust caps for panel types and the additional protective sleeve for cable types are available separately. Spare cable clamp sets are available to special order, please contact Technical Support. Draka's proprietary flexible flame-retardant DMC (polyurethane based) jacket complies with IEC 60332-1; IEC 60754-2; IEC 61034; LSOH making it suitable for building installation while remaining flexible enough for studio floor and OB use. 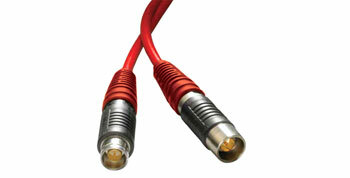 See Draka Triax 11 HD Pro Cable - Extended performance for full specification. Canford triax termination panels: Available for all Fischer triax and many other video, fibre and audio connector series, see Triax Termination Panels. Custom panels and wallbox plates: Custom and mixed layouts, engraved labels and mounting posts are available to special order. For further information or a quotation please contact the custom metalwork team via email, custommetal@canford.co.uk. Alternatively contact Sales. Canford high capacity, heavy duty cable drums: The CD3.6, CD4600, CD4700 and CD4800 series' are recommended to accommodate up to 460m Triax HD pro+ assemblies, see Cable Drums. Available at canford.co.uk/Technical/Article/CableDrumCalculator. Simply fill in the cable length, diameter and weight per metre and the calculator will display all suitable drums and the total weight including drum.